Custom applications are available for many vehicles not listed here. Call GEAR VENDORS customer service department for details. Automatic 4-Speed E40D with Driveline Park Brake.Replaces tailhousing.88-93 Ford chassis class A motorhomes w/park brake. Automatic 4-Speed E40D with Driveline Park Brake.Replaces tailhousing.93-99 F-Superduty and Motorhome chassis with driveline parking brake. Automatic 4-Speed 4R100 with Driveline Park Brake.Replaces tailhousing.99-00 V10, confirm 10th digit of VIN is X or Y, and if vehicle has 4-wheel anti-lock brakes. Automatic 4-Speed 4L80EB with Hydraulic Park Brake.Replaces tailhousing91-93 P30 chassis with auto park brake. Automatic 4-Speed 4L80EB with Cable Park Brake.Replaces tailhousing.91-93 P30 chassis with manual cable parking brake. Automatic 4-Speed Motorhome with Hydraulic Park Brake – Elec SpeedoReplaces tailhousing94-95 P30 chassis with auto park brakeRequires GM speed buffer (incl). Provide axle ratio and tire size when ordering. 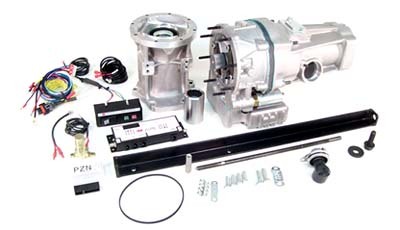 Automatic 4-Speed Motorhome with Cable Park Brake – Elec Speedo.Replaces tailhousing.94-95 P30 chassis with manual cable park brakeRequires GM speed buffer (incl). Provide axle ratio and tire size when ordering. Automatic 4-Speed 4L80EB with Hydraulic Park Brake.Replaces tailhousing.96 and newer P30 chassis with auto park brake.Requires GM speed buffer (incl), provide axle ratio and tire size when ordering. 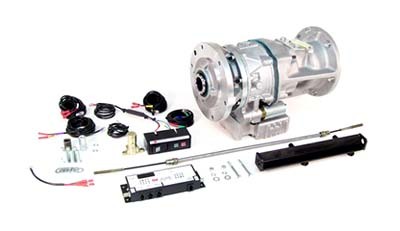 Automatic 4-Speed 4L80EB with Mechanical Park Brake,Replaces tailhousing,96 and newer GM P30 chassis with a manual cable park brakeRequires axle ratio and tire size when ordering.